Barnsley have sacked manager Andy Ritchie, six months after he led them to promotion to the Championship. Earlier in the week, Ritchie had said he was disappointed that the Oakwell board had refused to discuss a new contract with him. Academy manager Simon Davey has been placed in temporary charge of the team until a new boss is appointed. 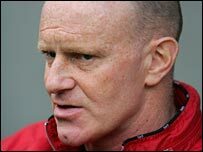 Ritchie was appointed to succeed Paul Hart as manager in May 2005 after a successful spell as caretaker boss. But despite winning promotion through the play-offs in May, the Tykes are second from bottom of the Championship. A lengthy statement on the club website said the decision to terminate Ritchie's contract with immediate effect was taken "with regret". "The decision by the board follows the failure to resolve differences with the manager concerning the need to strengthen the first-team squad to ensure survival in the Championship," it read. "In the close season, the board had earmarked funding specifically for squad strengthening. "It will be clear to fans that the desired strengthening of the squad has not been achieved. "Recently the club entered into contract negotiations with the manager and as part of these discussions, was seeking a commitment to squad strengthening. "Rather than creating a basis for a compromise in views, these discussions served to emphasise the difference in opinions on how the club can best maintain Championship status. "As a consequence, the board felt it had no alternative to the decision it has taken." In October, Barnsley rejected an approach from Yorkshire rivals Sheffield Wednesday to speak to Ritchie about their managerial vacancy. He previously managed Oldham between 1998 and 2001.